Game description: You can play more than 100 levels, ranging from biological to theological, in the 3D pinball game Flipnic: Ultimate Pinball. 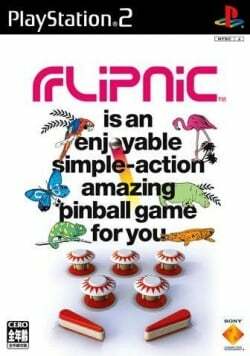 In addition to traditional pinball modes, Flipnic Ultimate Pinball includes minigames and two-player modes such as Foosball Striker and Basketball 1-on-1. The game also adds valuable power-ups and skills like jumping to the traditional pinball experience. Watch the in-game training videos to learn how to collect bigger jackpots. USA v01.60(07/02/2002), EE/VU Rounding: Chop/Zero, Plays all tables 100%, tested from memory card saves of complete game. Many hours of table playthroughs through emulator. FPS full 60fps. This page was last edited on 25 December 2016, at 17:52.